Efax.com is one of the leaders in online fax services. Our evaluation found it efax.com to be a great choice for individuals and those who do not send a huge number of faxes, but, rather wish to have the capability to receive them. They offer a great 30 day free trial, and after signing up, we found the system to be one of the easiest for customers to use. The company claims to have over 11 million satisfied customers around the globe and it is easy to see why. They include great desktop software, mobile apps, and unique features such as digital signature. 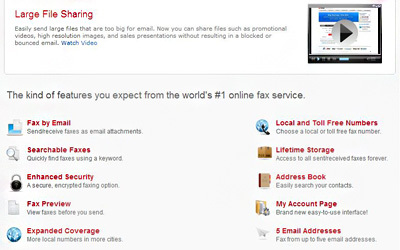 Service is available in more than 4,600 cities, making this one of the most convenient ways to send and receive faxes. There is a lot offered here at Efax.com to make using the service quick, easy, and convenient. The entire system easily integrates with MS Outlook and other email clients. It also includes an address book and fax preview. Easily send and receive fax documents as email attachments. There is also a signature stamp that allows users to digitally sign faxes which we found to be surprisingly convenient. The company has also included a mobile app that allows easy sending and receiving through your iPhone or Android device. Faxes can be sent securely, using encrypted data. Of course, you will always have the ability to preview your faxes before sending. Once sent, you may search through your list via keywords, making it easy to locate just the right one. Efax also provides expanded coverage, with more local numbers in tons of cities throughout the world. This even includes local and toll-free numbers. Automated fax logs are kept, discreetly storing each item you send or receive. 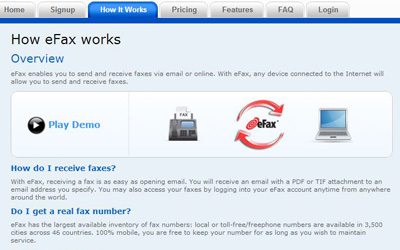 Users may even send and receive faxes from up to 5 different email addresses. The system also supports the sharing of large files, which can include videos, high resolution images, and even sales presentations. There are a number of security features included in the Efax service to protect your data and documents. For starters, the automated logs save a record of all your activity so you can keep track of documents received and documents sent. There is also a previewer that displays before anything is sent, helping you to notice and correct any potential mistakes. Finally, their enhanced security option ensures that all faxes are transferred over an encrypted server for extra safety. This would be best for a business, but can also help individual users as well. Efax offers two types of plans, there eFax Plus and the Pro service. Both offer the same excellent service and features. The main differences come down to pricing and the number of faxes you can send and receive. For example, the Plus plan does not have any type of set up fee. You may send up to 150 pages each month for free. Customers may also receive 150 pages each month. Anything above this will incur additional fees. The Pro plan allows users the ability to send and receive up to 200 pages each, per month. This also does not require any type of set up fee and there will be additional fees incurred for going over this allotment. The basic eFax Plus plan allows the user to send and receive up to 150 pages each, for a monthly fee of $12.95. If this allotment is exceeded, there is a $0.10 cents per page charge. The same thing holds true for the Pro plan, with a monthly fee of $19.95 and an allotment of 200 pages received and sent, each. There is also an additional $0.10 cents over the limit fee per page. One of the best points about this service is that they have a very intuitive user interface. There are 4 main areas: View Faxes, Send Faxes, Update Account, and Help. There is a message center, which is where faxes are sent and received; this works exactly like an email client, making it easy for even new users to understand and operate. You can download an attachment to a fax or forward it to another without jumping through any hoops. eFax.com provides all customers with 24/7 toll-free phone support, staffed some very helpful and knowledgeable representatives. The site even offers a support email, with most being answered in a few hours, along with live chat for instant answers. Plus, the site includes a number of frequently asked questions. We were also impressed by their user guide that may be downloaded as a PDF file. This offers step-by-step instructions and tips on how to best user the service and navigate the interface. 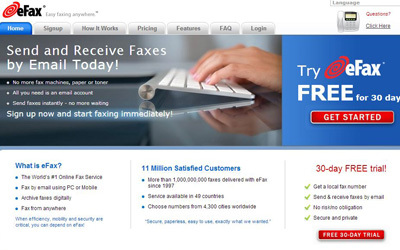 We believe that efax.com offers one of the best and easiest to use online fax client interfaces. There is also tremendous support available and the feature package is also quite strong. The only downside is that the prices are a bit high for this type of service, and the number of allowed pages sent/received may make this an even more expensive option. This is why we recommend this service for an individual user who does not send or receive more than 200 pages each per month.